Drummer Peter Ibbetson, brings together some of the finest musicians and improvisers currently working in Europe. The compositions penned by Ibbetson are influenced by the angular obscurity of bands such as BloodCount, Science Friction and AlasNoAxis, and the textures in bands such as Tortoise, Radiohead and Mogwai. Tom Challenger is part of the forward thinking LOOP COLLECTIVE and leads the band MA. He also plays in the band OUTHOUSE which features guitarist Hilmar Jennson. Alam Nathoo is a long term collaborator with Ibbetson and plays in the co led SECOLLECTIVE band - MAP. Tom Farmer is one of the most in demand bass players of his generation. He plays in the critically acclaimed 'EMPIRICAL' as well as bands with Challenger (DICE FACTORY) and many more. The music written by Ibbetson reflects an idea of bringing influences from a range of sources as a catalyst for group improvisation. 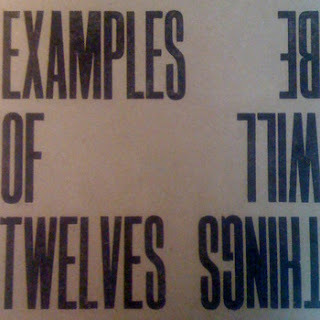 Playing mainly original material Examples of Twelves constantly strive for a balance between the written and the improvised. Combining elements of jazz, classical, improv, dance and rock music into one fruity blend. Strong writing is combined with equally strong musicianship; the band features many of the leading lights of the current UK scene.